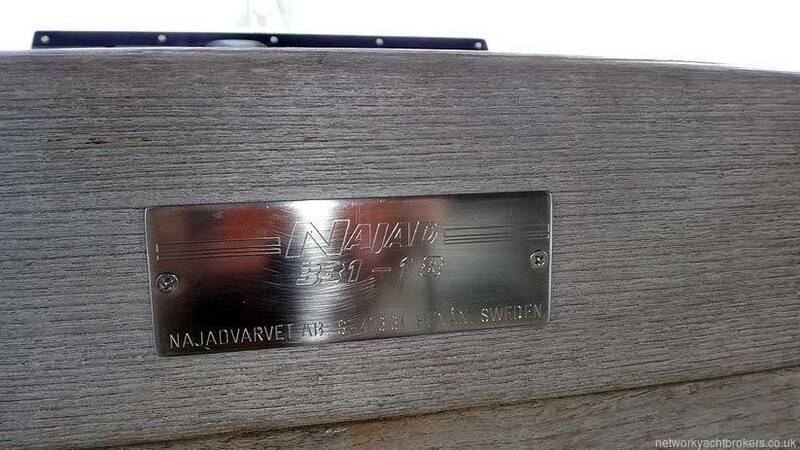 Najad yachts are built in Sweden and with all Swedish builders the focus is on durability, quality and excellent sea keeping qualities. 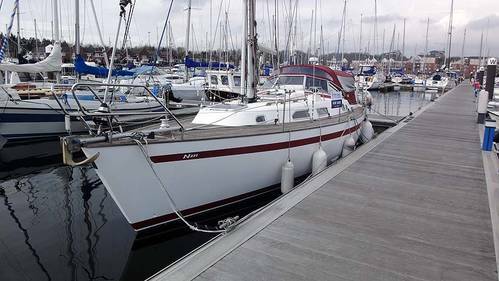 This Najad 331 is a great example of these qualities and will impress you with its build quality, attention to detail and the sense of solidness when on board. 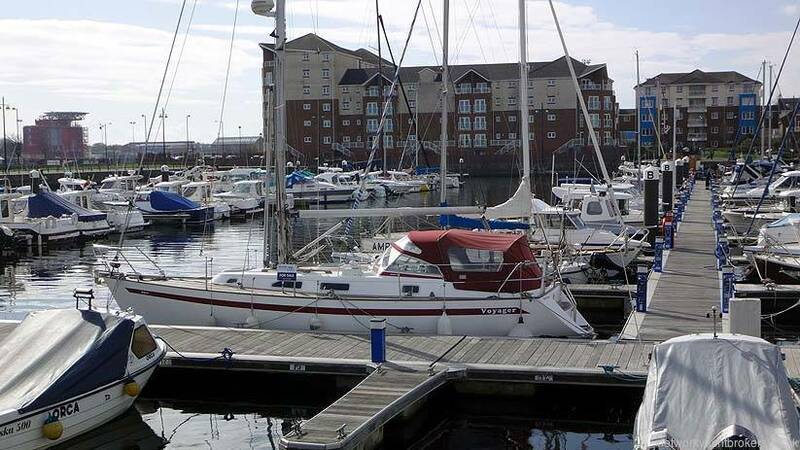 Mechanically she is fitted with a very reliable Volvo Penta MD2030 inboard diesel engine and saildrive unit. 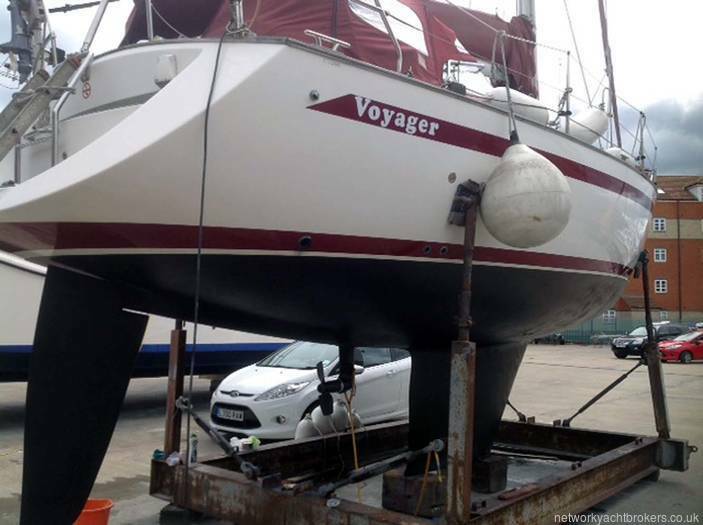 The engine has been well maintained and serviced annually. 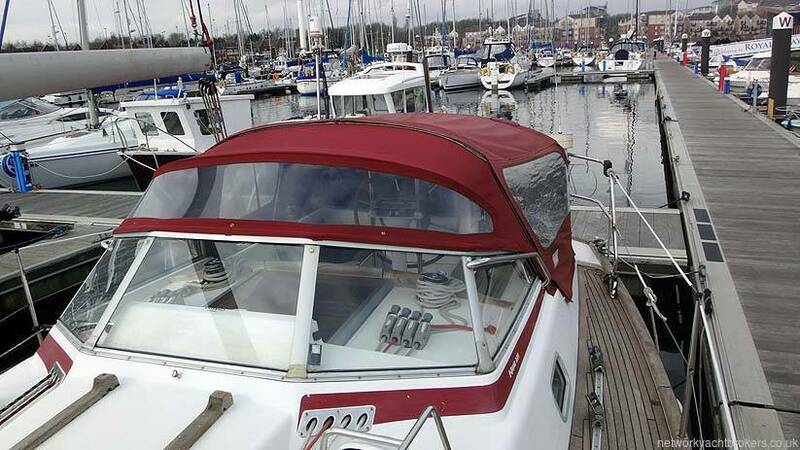 The hours are a meagre 1650 meaning she will provide many more years of good service. 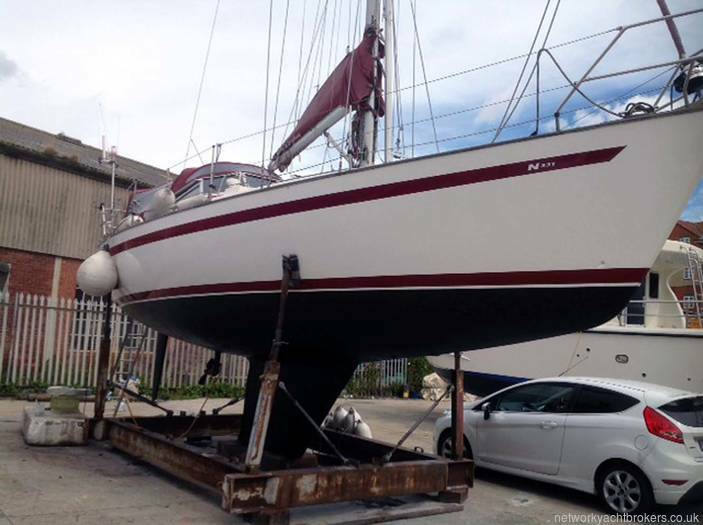 Externally she has the white hull with the burgundy striping and matching canvas work. 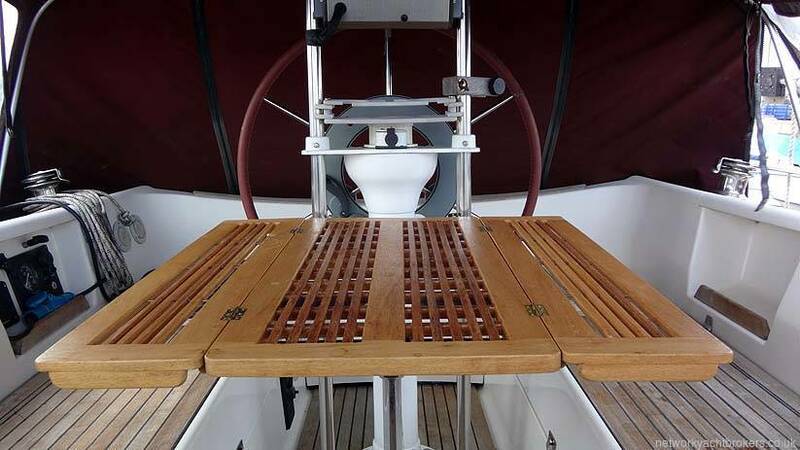 The decks and cockpit sole are finished in teak giving a classy feel and appearance. 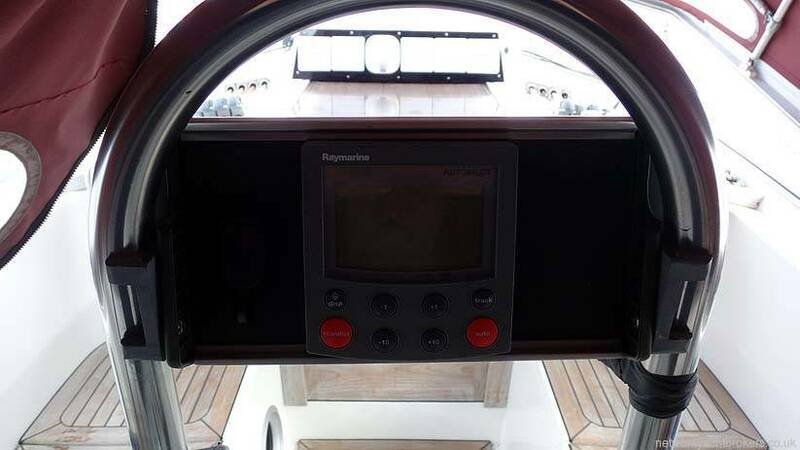 The cockpit is large and safe with binnacle mounted wheel steering. 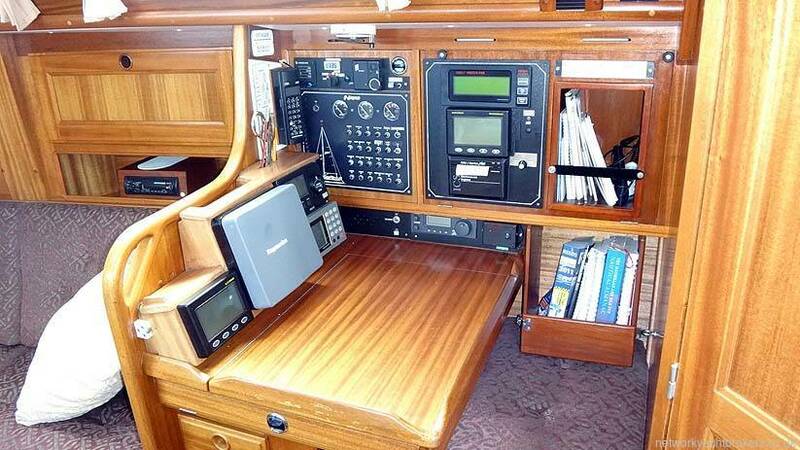 Decks stepped mast with all lines led aft for ease when short handed. 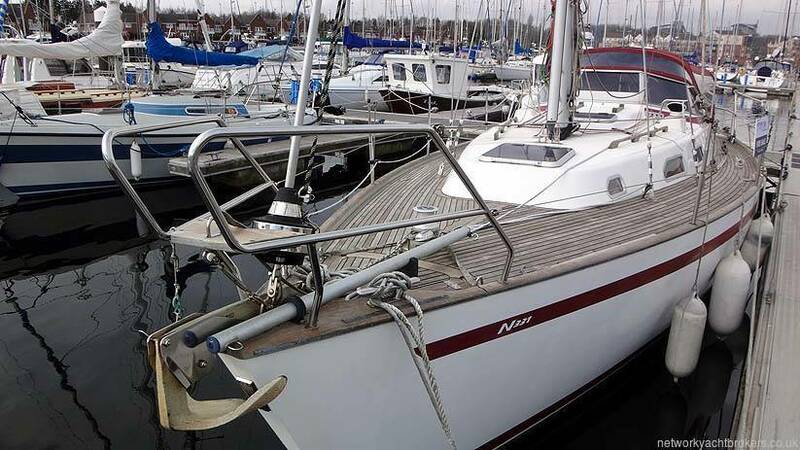 Excellent suit of sails and excellent electronic navigation aids. 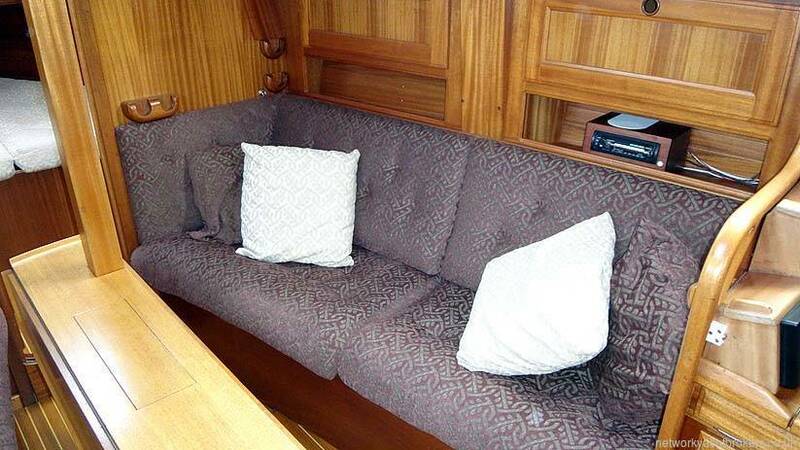 Beautifully finished below decks with classic mahogany finish which compliments the wine and cream upholstery perfectly. 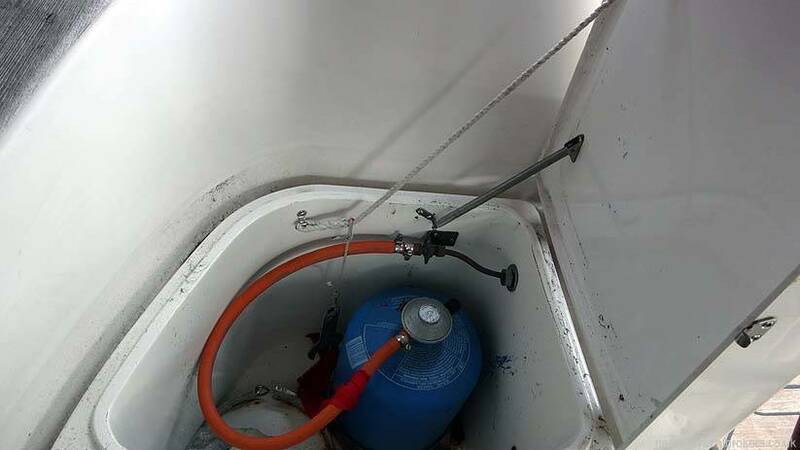 Boat kept warm and dry with diesel fired heating. 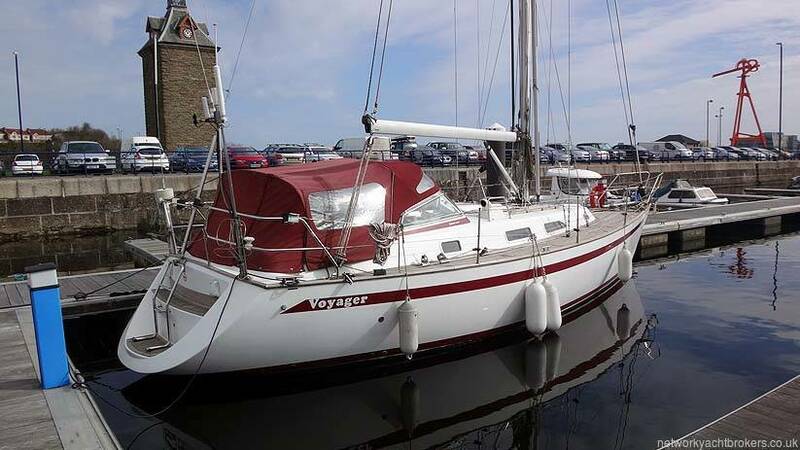 Below decks is as you would expect from a builder of this pedigree. 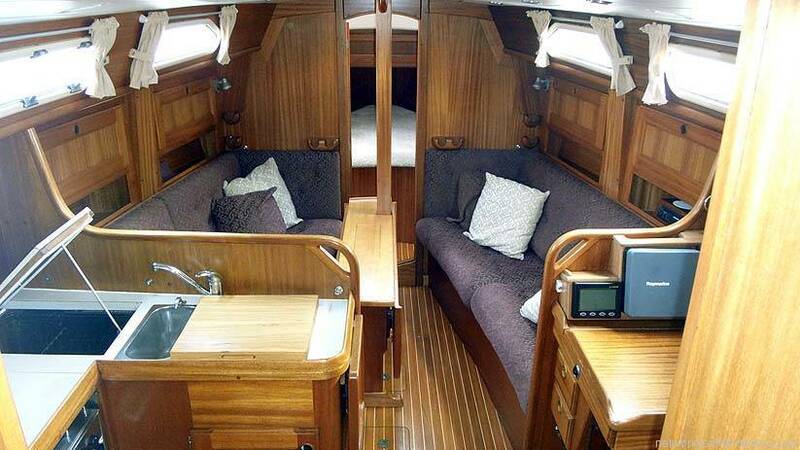 The interior is warm, welcoming and has a traditional feel whilst feeling luxurious. 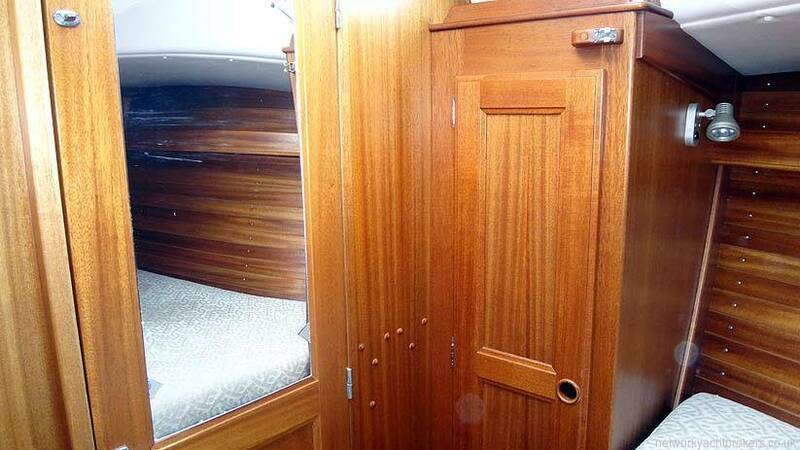 The interior wood is a mixture of teak and mahogany. 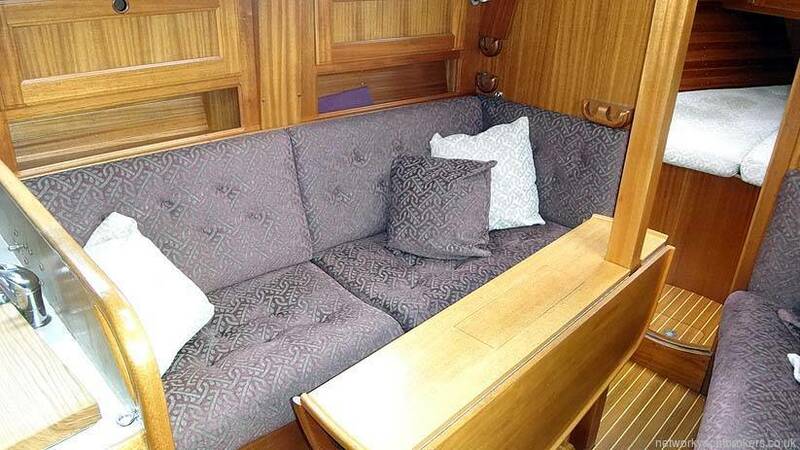 The upholstery is well padded and covered in classic wine coloured hard wearing materials. 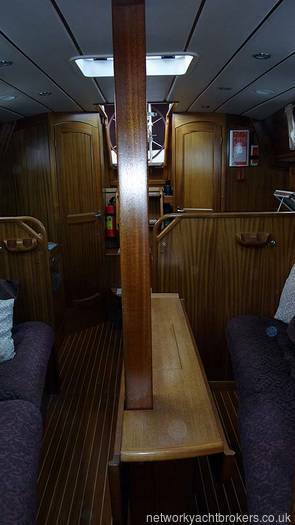 The main saloon is entered from the cockpit. 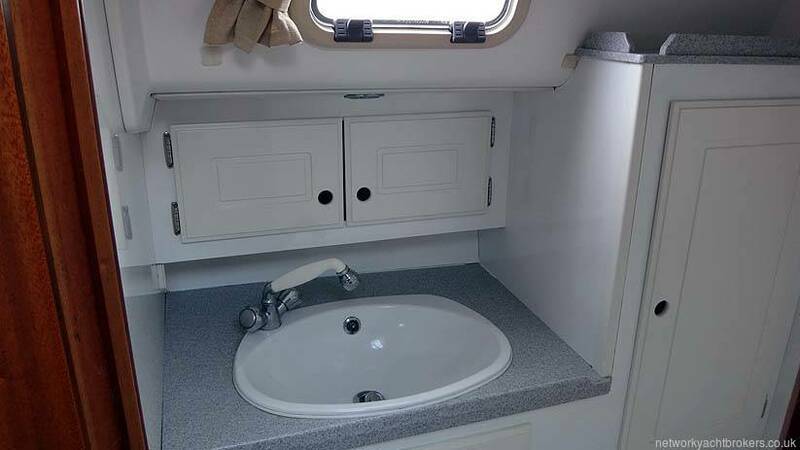 There is a sliding perspex hatch and a set of three wooden wash boards. The headroom is great and those above 6 foot will appreciate this. 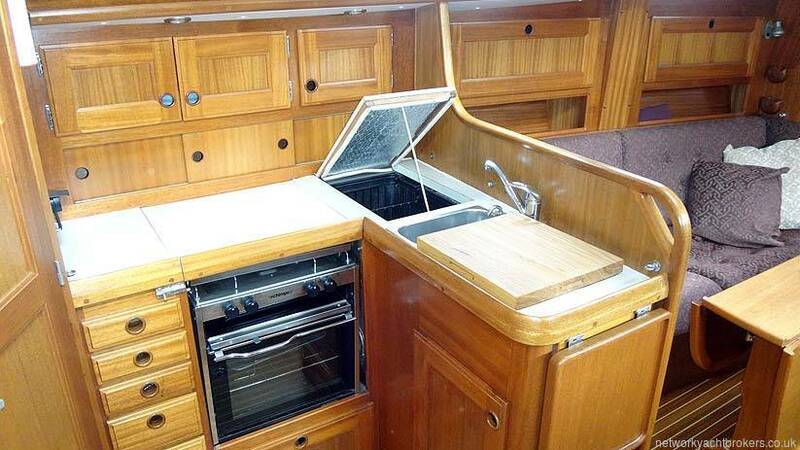 The galley is to port and features a gas fuelled oven with 2-burner hob and grill. 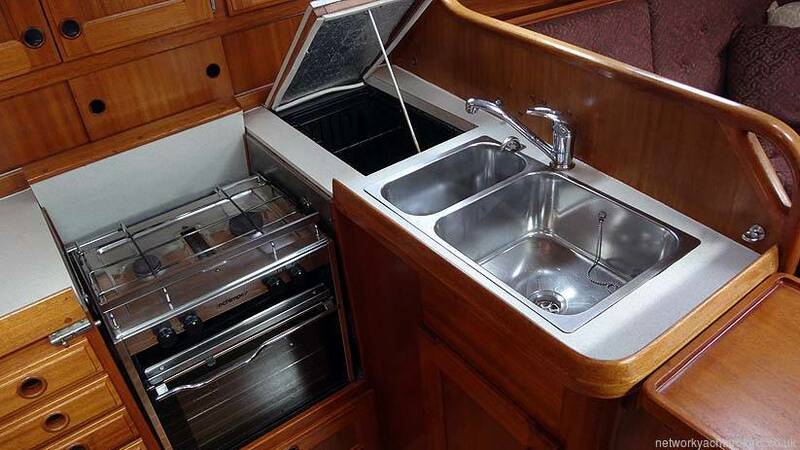 The work space is good and a cover extends over the cooker and the double stainless steel sink. Top loading large capacity fridge takes care of the perishables. 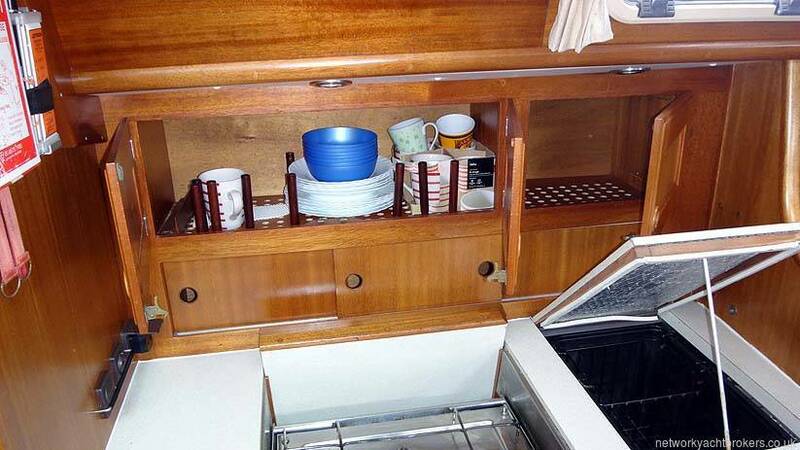 There is oodles of storage too making long range cruising a reality. 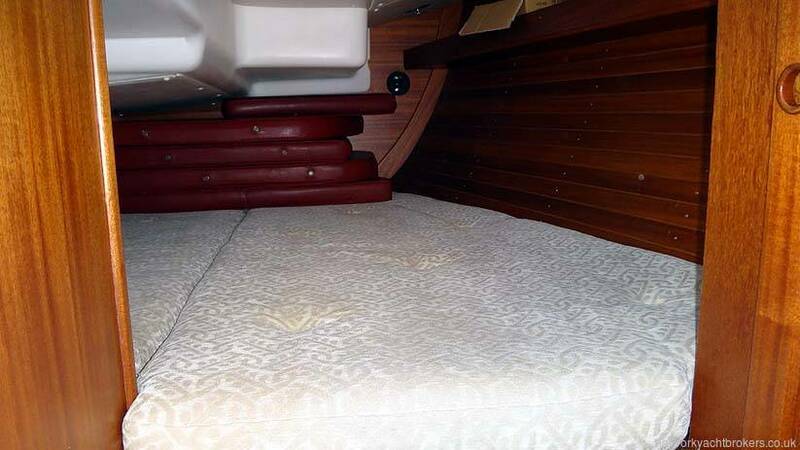 Aft of the galley is the aft cabin with double berth. 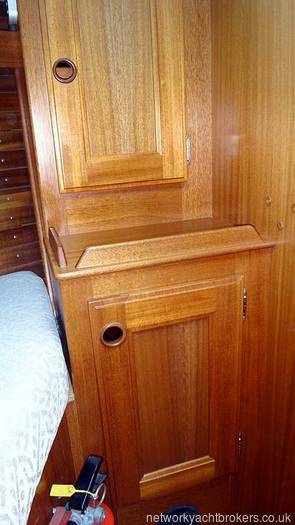 There is a hanging locker for clothing, opening port for light and ventilation and 12V lighting for reading. 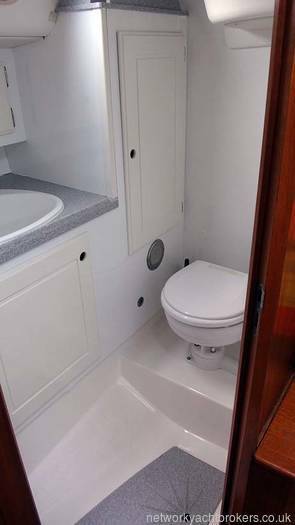 Adjacent is the heads compartment with sea toilet and shower. This easy clean area is finished in white making the space feel larger than it already is. 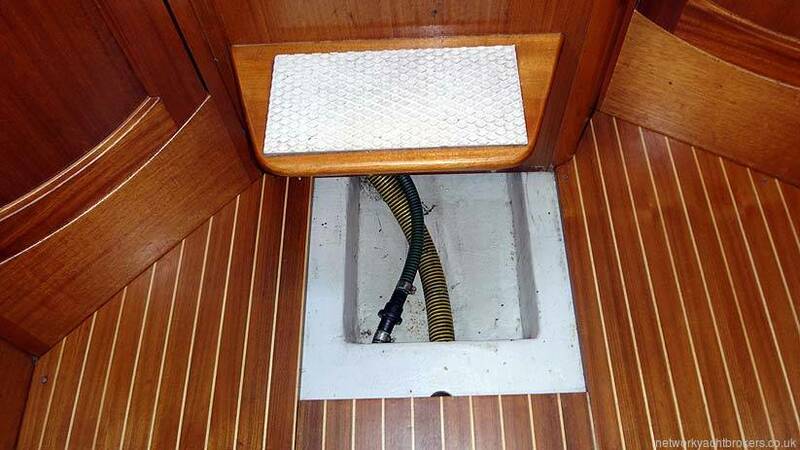 Again there is ventilation and 12V lighting and a wet locker for the oil skins. Forward of the heads is the large chart table with forward facing seat and chart storage. 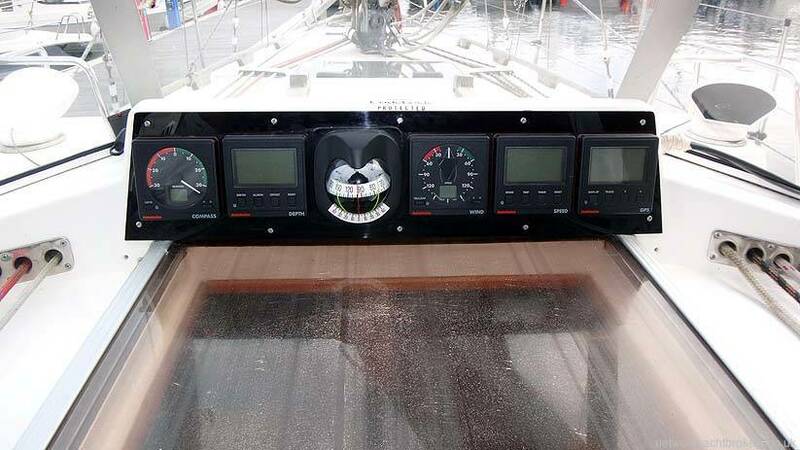 Situated here is the 12/240V panel with tank and battery gauges. 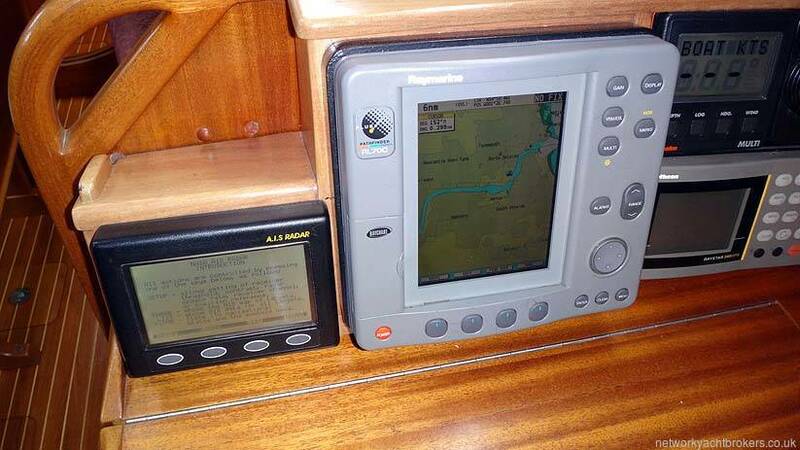 Also here is the huge range of electronic navigation aids from plotter to VHF and up to date information via the navtex. 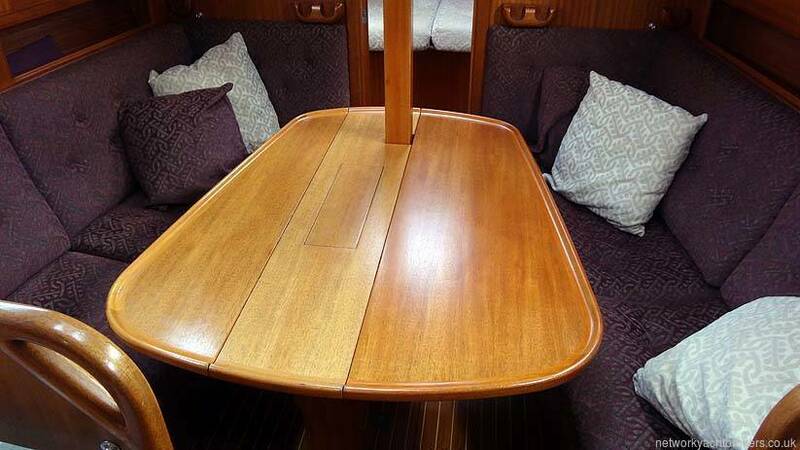 The saloon has a central table with drop leaves. 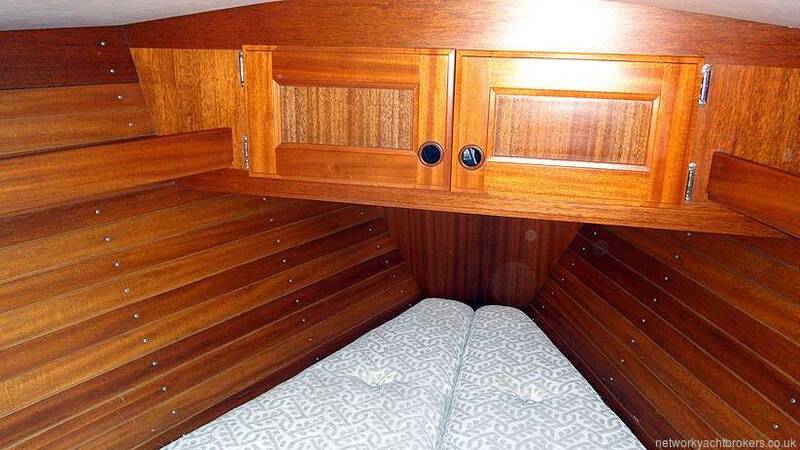 Either side are comfortable settee/berths and again acres of great usable cupboard storage. 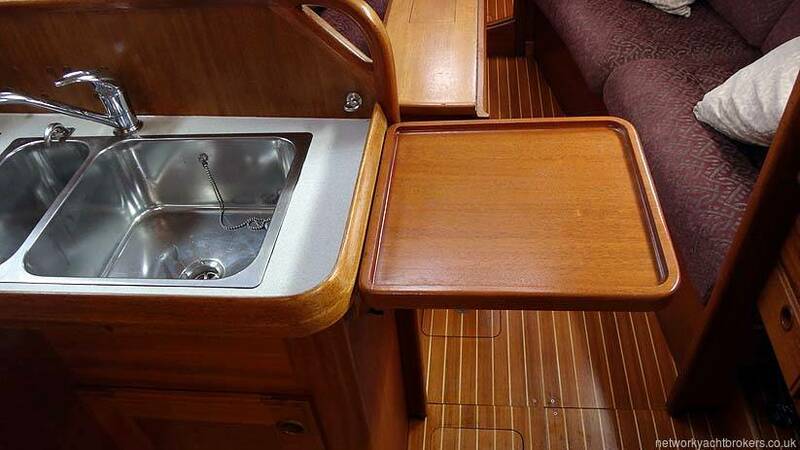 Forward of the saloon bulkhead is the large double berthed cabin with open shelf lockers, hanging locker, two cupboards and an opening deck hatch for natural light and ventilation. 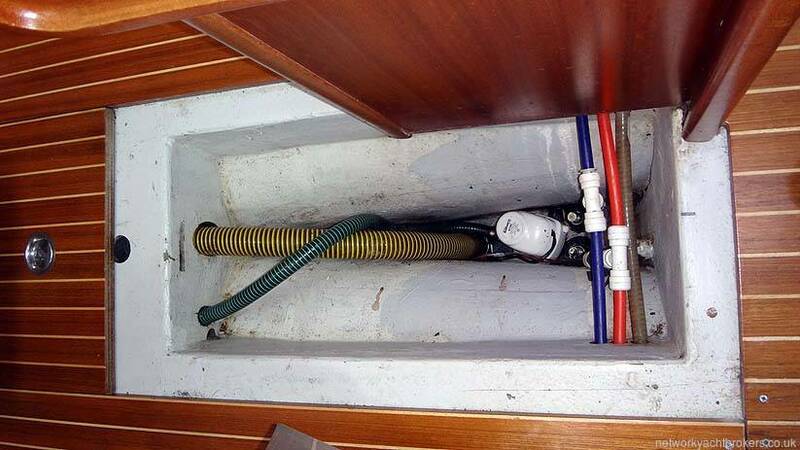 Boat kept warm and dry by diesel fired heating. 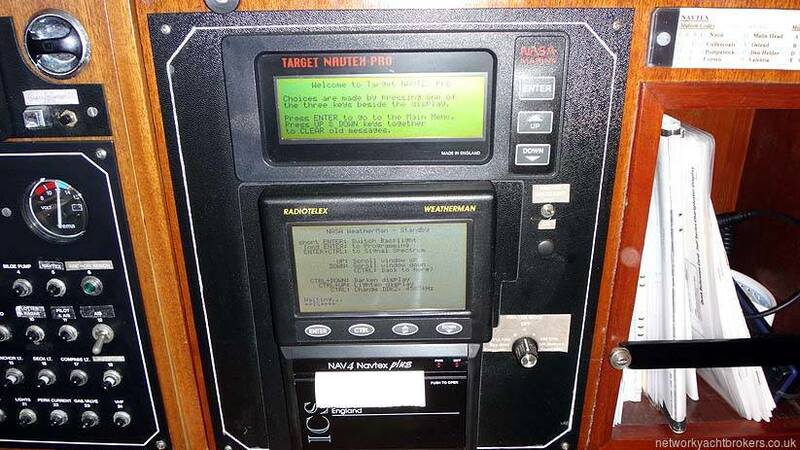 This extends the season greatly and is a must when boating in our Northern waters. 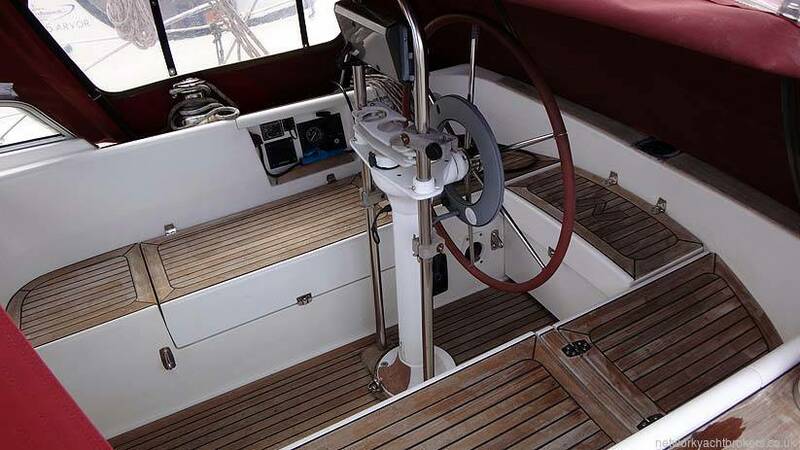 Vessel powered by a very reliable and economical Volvo Penta MD2030 inboard with sail drive unit. This fresh water cooled, 28hp unit has been regularly maintained with most recent service in early 2016. 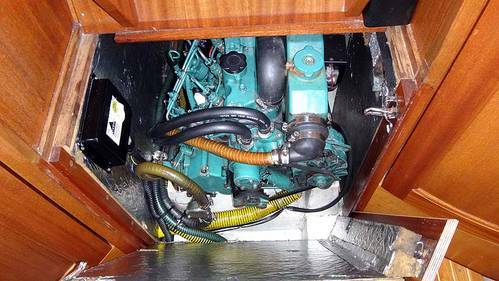 The engine is housed in a sound and fire proofed box beneath the companionway. The access is good and allows access to front rear and sides for servicing and daily checks. 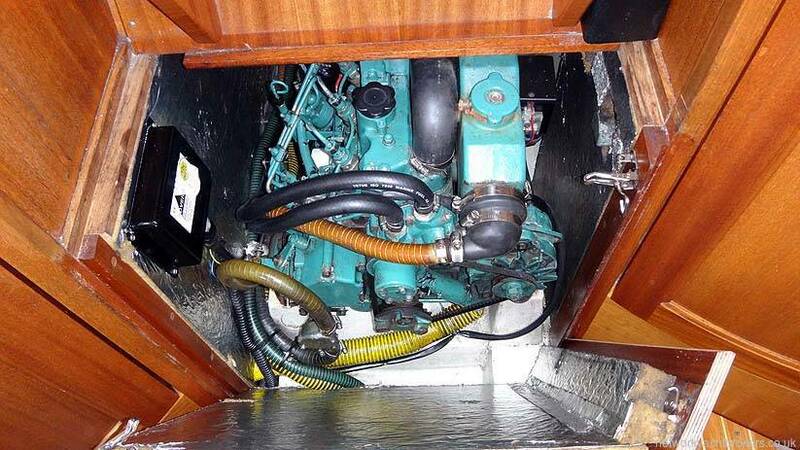 Sail drive unit had gasket replaced in 2008. 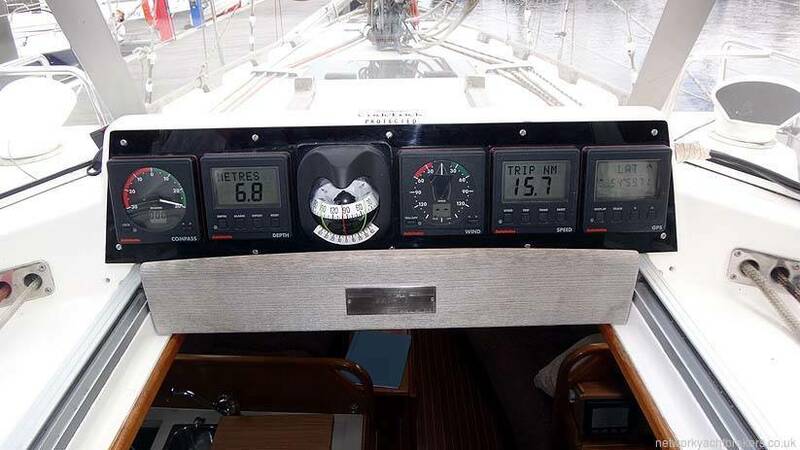 Engine start panel in cockpit with rev counter and single lever engine control. Bank of 3 batteries fitted with isolators. 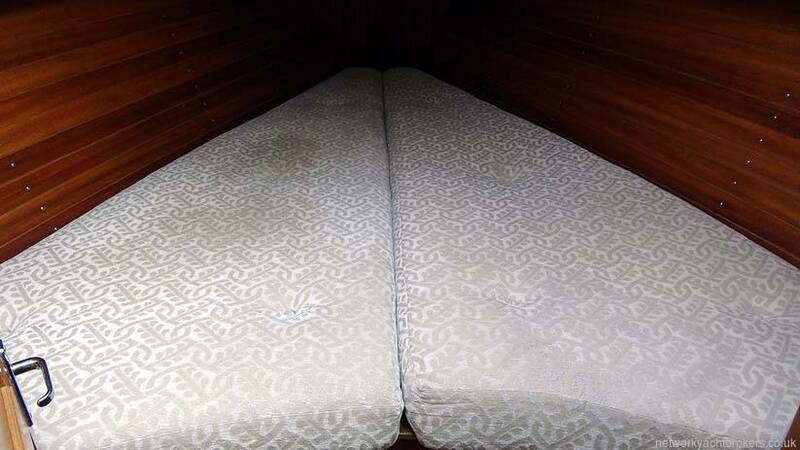 These have been replaced on a regular basis and are in good order. 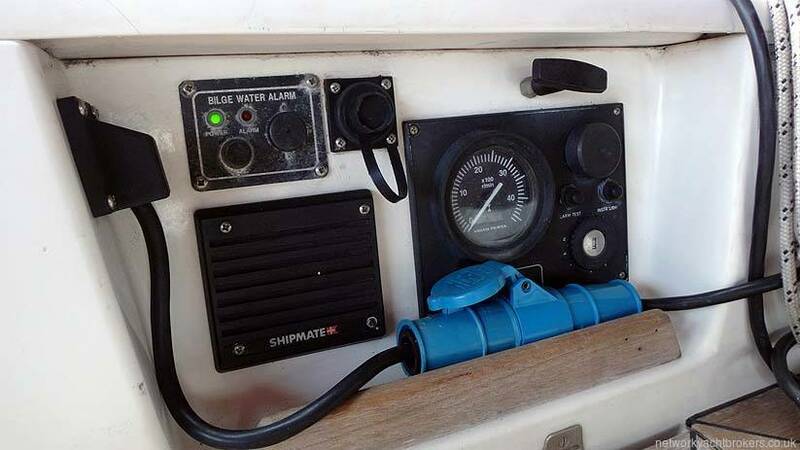 They are recharged via the engine alternator or the Vitron 25amp battery charger when attached to shore power. 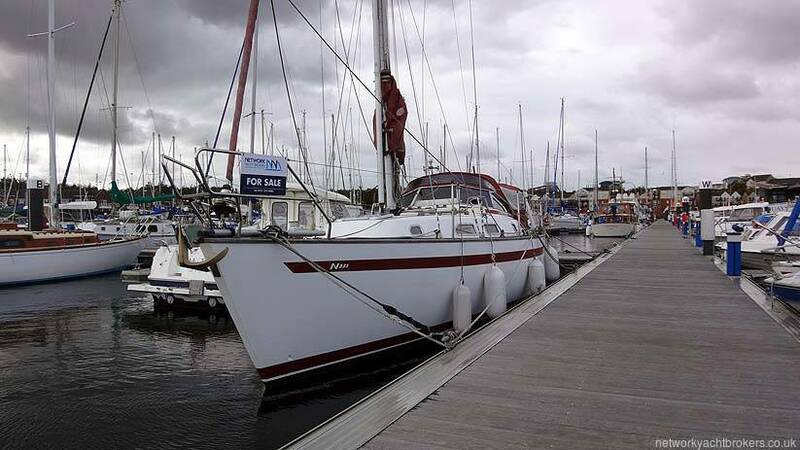 Sloop rigged yacht with fractional 19/20th aluminium deck stepped mast head rig. Solid rod kicker to boom. 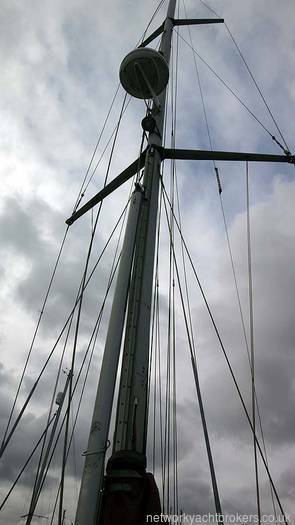 Stainless steel standing rigging replaced in 2009. 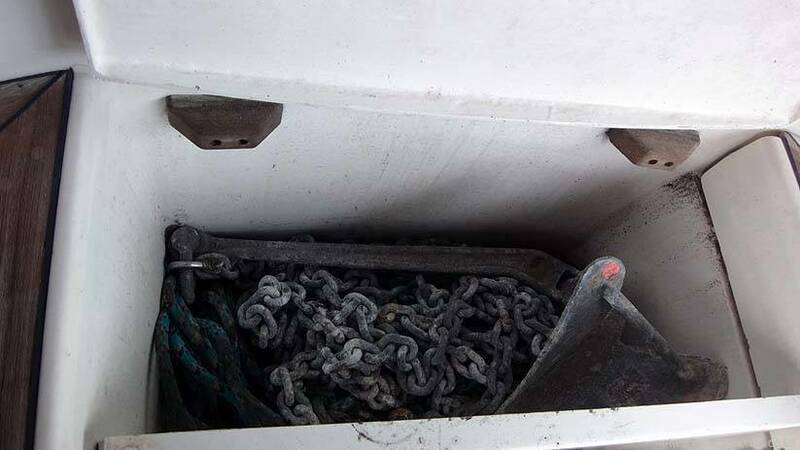 Terylene running rigging in good order and replaced on a preventative maintenance schedule. 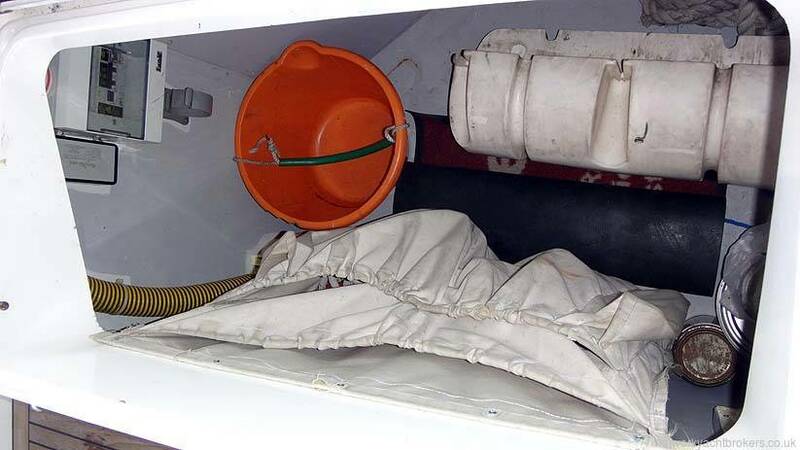 Mainsheet attachment in cockpit forward of binnacle. 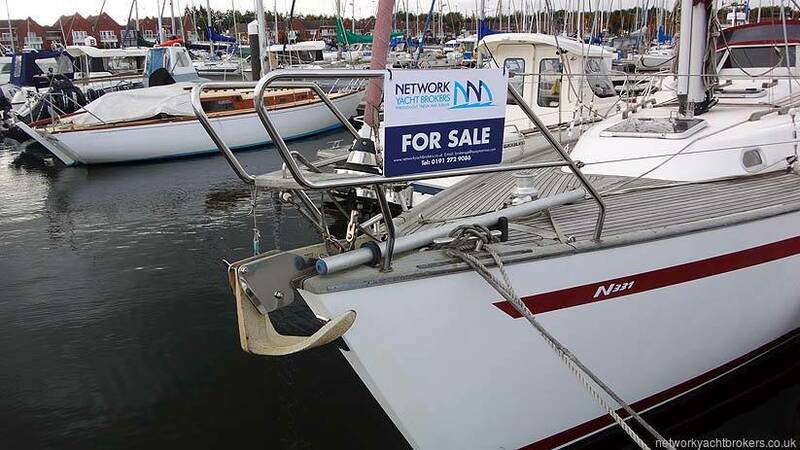 This can be moved outboard when relaxing in the marina. 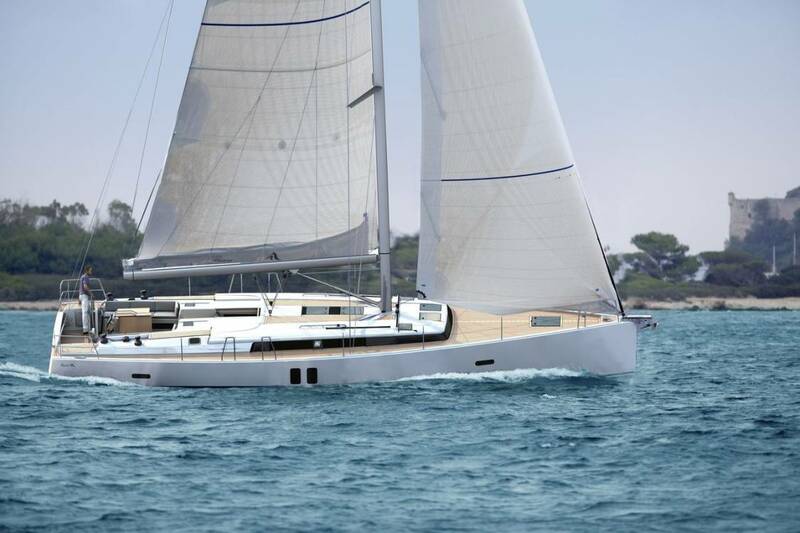 All lines are led aft to helm allowing easy short handed sailing. 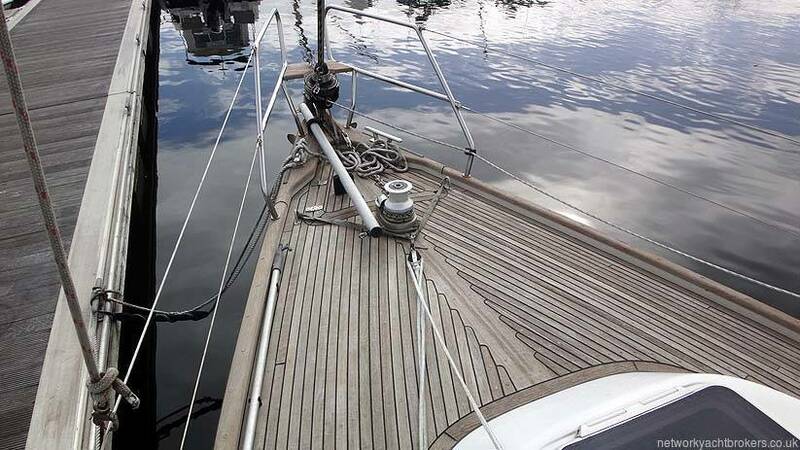 Aluminium bowsprit pole when flying the asymmetric Code O kite and conventional spinnaker pole mounted on mast when flying conventional spinnaker. 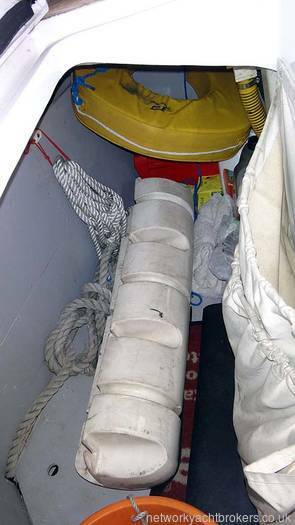 Sails include:- Fully battened mainsail with 3 reefing points mounted in lazy bag. 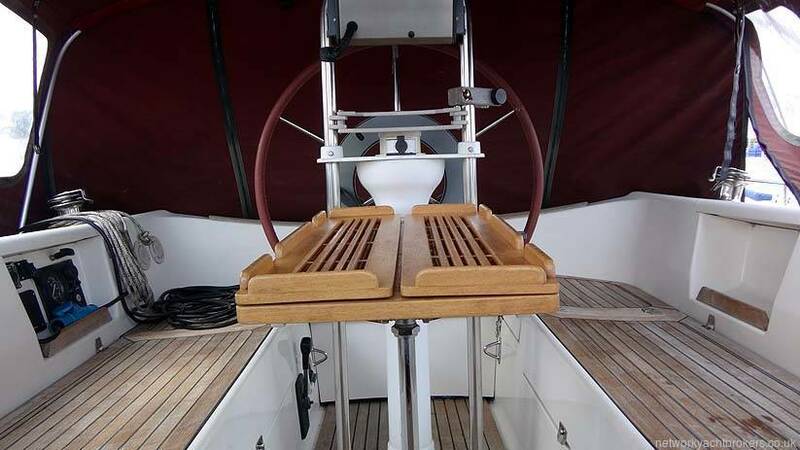 Roller furling genoa with UV strip. 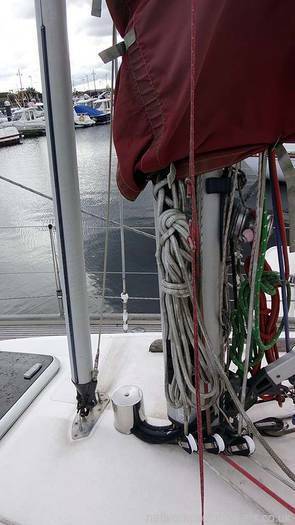 Code O cruising chute, spare jib and spinnaker with snuffer. 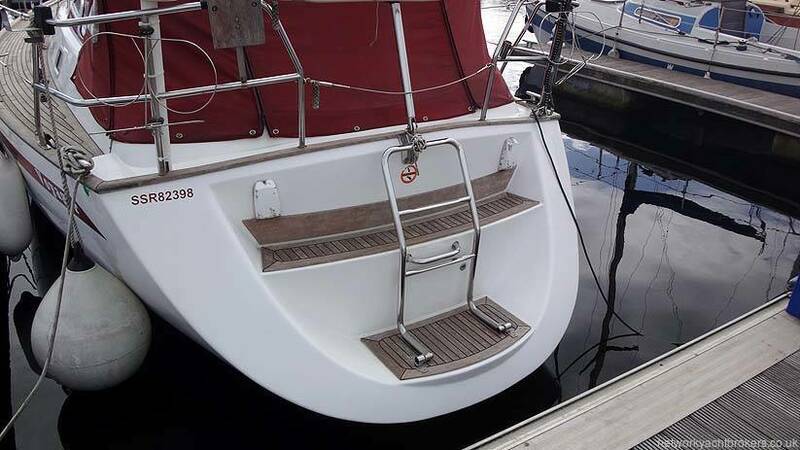 Heavy layup GRP hull in white hi gloss flow coat. 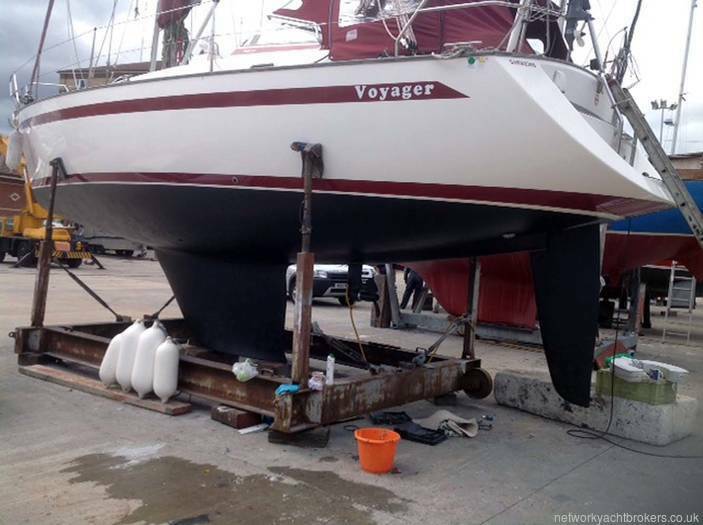 Under water areas antifouled in contrasting black coatings. Large self draining cockpit finished in teak. Binnacle mounted wheel steering with removable cockpit table. 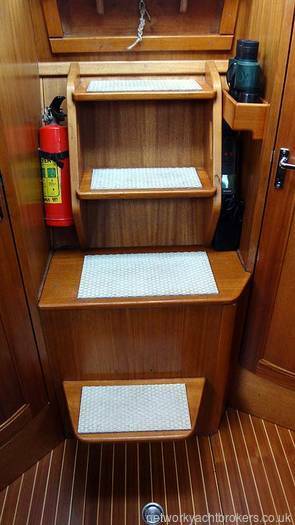 Large cockpit lockers topped in teak. Full set of bespoke cockpit cushions for comfort. Whole area is kept warm and dry by a full cockpit canopy. 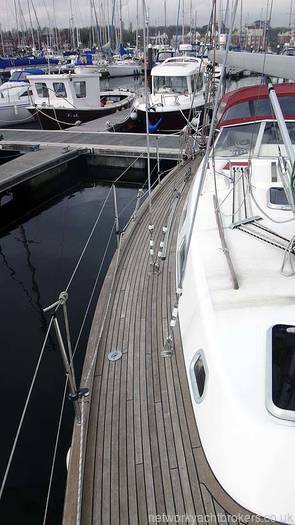 Nice wide side decks allows easy access forward. 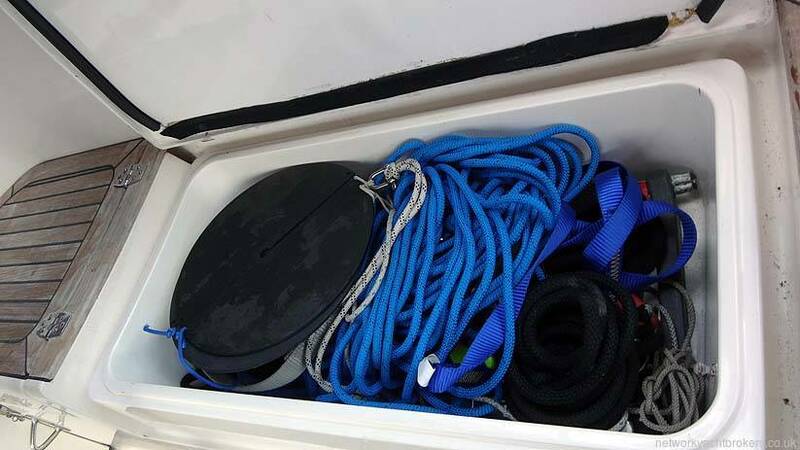 Large self draining anchor locker with ground tackle and electric windlass. 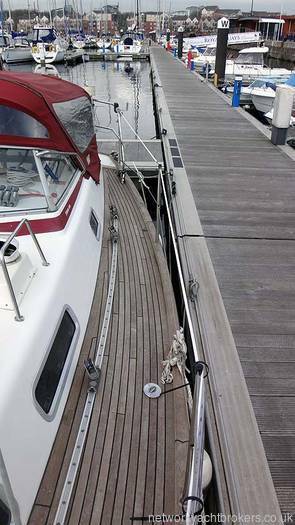 Side decks finished in teak.